﻿ Revelation 3:11 'I am coming quickly; hold fast what you have, so that no one will take your crown. I am coming quickly. Hold on to what you have, so that no one takes your crown. I am coming soon! Hold on to what you have so that no one takes your victor's crown. I come quickly, hold firm what thou have, so that none may take thy crown. I am coming quickly; hold fast what you have, so that no one may rob you and deprive you of your crown. I am coming soon [or, suddenly. See 2:16, 25; 3:3]. Hold on firmly to what you have [i.e., opportunity, obedience, steadfastness, etc.] so that no one takes away your crown [See 2:10]. I come quickly: hold fast that which you have, that no one take your crown. I come quickly: keep that which you have, so that no one may take your crown. I am coming soon; hold fast to what you have, so that no one may take your crown. behold, I come quickly: hold that fast which you have, let no man take your crown. I come quickly: keep that which you have, that no man take your crown. I am coming quickly: hold fast that which you have, that no one may take your crown. I am coming soon. Keep hold of what you have, so that no one may deprive you of your crown. I come quickly. Hold fast what thou hast, that none take thy crown. 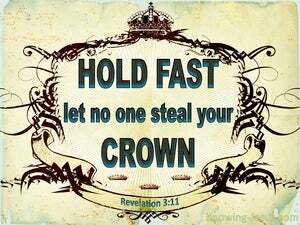 Behold, I come quickly; hold fast that which thou hast, that no one take thy crown. Behold, I come swiftly: hold what thou hast, that none take thy crown. Behold, I come quickly: hold that fast which you have, that no man take your crown. I am coming quickly! Hold fast to what you have, so that no one may take away your crown. Behold, I come quickly. Hold fast to that which you have, so that no one may take your crown. I am coming very soon: hold to what you have, in case your crown is taken from you. I am coming quickly. Hold fast what you have, that no one may take your crown. I am coming quickly. Hold firmly that which you have, so that no one takes your crown. I come quickly; keep what you have, that no man may take your crown. 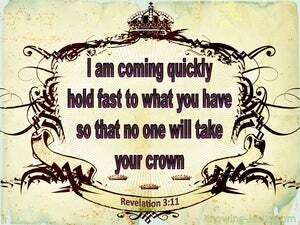 I come quickly: hold fast that which thou hast, that, no one, take thy crown. 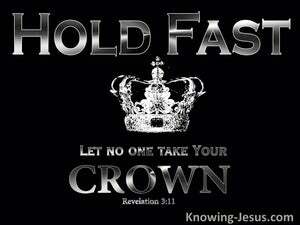 Behold, I come quickly: hold fast that thou hast, that no man take thy crown. I will come quickly. Hold to what you have received, that no one may take your crown. I am coming quickly: cling to that which you already possess, so that your wreath of victory be not taken away from you. I am coming soon. Hold on to what you have, so that no one may take away your crown. I am coming quickly! Hold firmly that which you have, so that no one takes your crown. I am coming speedily; hold fast that which you have, that no one take your crown. 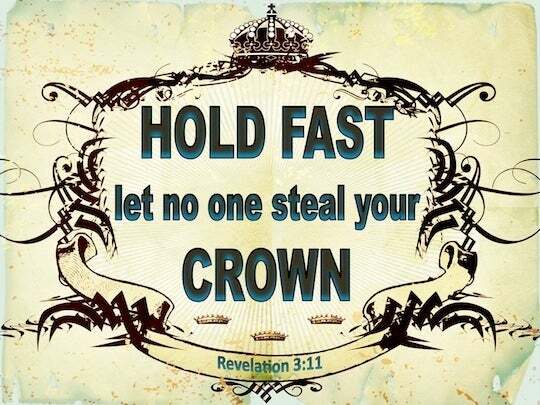 Behold, I come quickly; hold fast what thou hast, that no one may take thy crown. 10 'Because you have kept the word of My perseverance, I also will keep you from the hour of testing, that hour which is about to come upon the whole world, to test those who dwell on the earth. 11 'I am coming quickly; hold fast what you have, so that no one will take your crown. 12 'He who overcomes, I will make him a pillar in the temple of My God, and he will not go out from it anymore; and I will write on him the name of My God, and the name of the city of My God, the new Jerusalem, which comes down out of heaven from My God, and My new name. 'Nevertheless what you have, hold fast until I come. "And behold, I am coming quickly Blessed is he who heeds the words of the prophecy of this book." Everyone who competes in the games exercises self-control in all things They then do it to receive a perishable wreath, but we an imperishable. Do not complain, brethren, against one another, so that you yourselves may not be judged; behold, the Judge is standing right at the door.